The average cost of farming – Is technology helping, or are the costs just adding fuel to the fire? It’s an interesting thought – with the cost of maintaining agriculture already at an all time high, is the promise of technology simply adding additional costs with little reward? 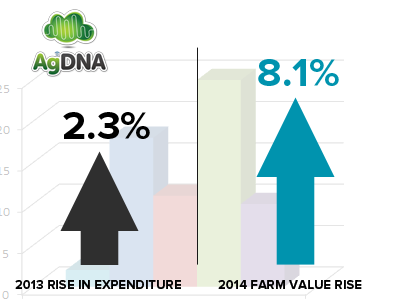 Last month saw the USDA release their findings on the cost of maintaining an average farm in the United States in 2013. The numbers are quite staggering, but in comparison to previous years the change in overall cost has been minimal. In 2013, Farmers spent $367.3B on agricultural production, a figure that equates to $175, 270 per farm. Interestingly, this figure is actually 2.3% higher than the costings for 2012, a season that also saw with it a change in the industry brought on by drought and other natural disasters. However while the cost of doing business may have risen, the impact of technology is certainly being felt when you compare this number to the rise in the dollar value of fields and pastures. Since 2013, the value of US farms rose 8.1%, due to a combination of better land management techniques, and a boost to the property values of rural America. While technology is seen as an added expensive and has certainly impacted the cost of business, we can also see clearly that those costs are being dwarfed by the overall value that increased efficiency has brought to the industry. Value that has been achieved in less than 12 months. This entry was posted in agriculture, crop, cropping, farm, General, mobile, scouting and tagged agriculture, cost, crops, farming, gis, gps, maps, technology by agdna. Bookmark the permalink.